Sasha Jackson Mysteries : Really Groovy Interview with James Huskins! appliances and some great music! 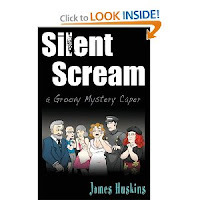 Below is an interview with James Huskins, author of Silent Scream, the first in a series of whodunits that are making the world groovy one page at a time. Jill Love your character names! Yancy Dunkle, Nora Bates, Florence Finch, Harvey Tuttle... How do you come up with them? James Thank you, Jill. While the book is set in 1960, most of the characters in Silent Scream were involved in the early talkies when they were starting out in Hollywood. A big part of my research involved watching movies from that era. I simply took the first name of one actor and the second name of another from the credits (which in those days were at the beginning of a movie). Several readers have commented they’ve seen a movie with Alister Powell, which is a combo of two prominent leading men - naturally, I always agree he’s great. My protagonist, Yancy Dunkle, had different origins. I grew up in Yancey county and always loved that name, so I chose the alternate spelling for his first name. I came across the Dunkle surname while skimming European genealogy charts. It’s a German name that means “the dark one” – a perfect fit for my main character! James All the books in the Groovy Mystery Capers are completely self-contained mysteries, but the first three are a trilogy that happen back-to-back. I’m currently writing the sequel which picks up exactly where Silent Scream left off. More Midgets, More Mascara ...and Murder! Yancy and a few characters from the first book are at the National Date Festival, an annual Arabian themed event held in Indio, CA. Yancy anticipates a relaxing week with time to enjoy the parade, a musical show, a costume ball, the rodeo and camel races. But as soon as he arrives, a child goes missing and her mother asks for his help. Not long after, a priceless necklace is stolen from a locked room. Yancy has his hands full working on two mysteries ...and a murder. Jill If mad scientists created a special potion that could make book characters come to life for a day, which fictional character in general fiction would you choose to hang out with? And which character would you choose from mystery fiction (not counting your own characters)? In both cases, tell me why. James Since I began reading for pleasure at the age of ten, I’ve almost exclusively read mysteries, and I reread many of them repeatedly because I love to hang out with the characters. Picking just one seems almost impossible, but if I had to, it would be the 80s character Jacqueline Kirby created by Elizabeth Peters. To date, there are only four novels featuring her and those paperbacks are so dogeared I’ll soon have to replace them – hardbacks this time around. Jake has given up smoking (many times) but still carries an ashtray in her enormous purse and constantly bums cigarettes from assorted characters. Her idea of heaven is a place where cigarettes and vodka won’t harm you. She’s oblivious to her many faults – what’s not to love? An ex-librarian, she decides to become a romance writer and blackmails her way into the top agents stable of authors and becomes a bestseller. My hero! Hanging out with Jake would be a non-stop party celebrating all the good things in life – cigs and vodka and mysteries and writing. What a day that would be! Jill You admit to being something of a late-bloomer, at least in terms of writing and publishing (your bio on Amazon says you launched a writing career midlife). What took you so long? James I wrote my first novel-length manuscript while in high school – my fave authors just couldn’t write as fast as I could read, so I had to make up my own mysteries. But writing has never been a career that could support you without a day job (unless you’re in the top ten of your genre) so I pursued other interests that would pay the bills – photography and graphic arts. Now that I’m in early retirement I can do what I’ve always wanted to do – write. write in a different time period/historical era, when would you choose? James The Roaring 20s might be fun – I’m drawn to periods where people broke the rules and their passion for life caused them to behave in unorthodox ways. Some really great art was created during those periods in our history. Jill Is it ever difficult or frustrating to write a book set in the past? Your characters can’t text each other, they can’t see Florence Finch on YouTube, Yancy doesn’t get to use Google Maps to plan his drives, and Nora Bates won’t have the chance to take advantage of the wonders of Botox. Do you ever catch yourself accidentally slipping in a modern convenience? Do you ever wish that some modern convenience had been around way back then just because it would make the plot advance more easily? James Exactly the opposite! Today we can google someone and find out everything - just everything - about them, read their blog, pull a credit report, use GPS to track their movements. It’s just too easy. Before all the conveniences, people had to use their wits to solve a crime. But as an author, those conveniences are heaven when it comes to research – and can you imagine the number of drafts you’d have to write on a typewriter? And yes, I make slip-ups. Even though I grew up in the 60s, memory has a way of playing tricks. I had a character calling 911, which didn’t occur until 1976 I believe. And calling long distance without the assistance of an operator didn’t come about until the 70s as well. Then came a question about saran wrap – it was invented in the late 40s but I’m still not sure when it became a household item, so I changed that scene during a fact-checking edit so I wouldn’t have to deal with it at all. I do my best to make it as accurate as possible – but it’s never frustrating to me, I love doing that research. Just about everything interests me. Jill How many books do you plan to write in the Groovy series? 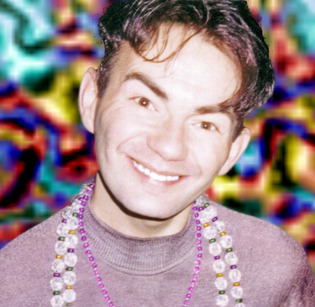 James Originally, one for each year of the 60s. Then the first three became a trilogy that happen in the same year, so I’m up to thirteen at least if I follow that plan. I’m just happy spending time with those characters – they entertain me to no end. Jill What are the last three songs that came up on you iPod? James I have no idea – I rarely use it as I’m sitting at my laptop all day. There, I usually listen to internet radio stations. But when I’m writing, as well as reading, I require total silence without distractions so I just throw it on while I’m cooking or doing other chores. Jill Tell me something about yourself that you think readers should know OR that readers would find surprising about James the Author. James You mean, like my days in summer stock theatre, or shoveling manure when I was a kid in exchange for horseback riding lessons, or eating bouillabaisse and saying I liked it so a local artist would teach me to paint … things like that? Ah, those things I don’t talk about – one has to keep up the Author Mystique. Note: I do reveal a few things in the Author Bio on my site www.jameshuskins.com including a 70s recording of me plotting one of my first mysteries. James Oh, that sounds interesting – wish I could have been there. Probably the strangest thing that’s happened so far was when a psychic fan told me all about my main character and his motivation – before the first book came out and he had read it. He wasn’t even in the ballpark but I loved his enthusiasm so I just smiled and nodded a lot. James Thanks so much for asking me to appear on your blog! Jill The pleasure was all mine! Thank you! This was great, thank you both! I'll be honest, I hadn't heard of James before but this book sounds fabulous. I always wanted to be a 60's chick. Sadly, I was born too late. Thanks for this wonderful interview, Jill! I agree with you: these characters are great fun. James did an outstanding job creating them, and the attention to detail is apparent in their names.